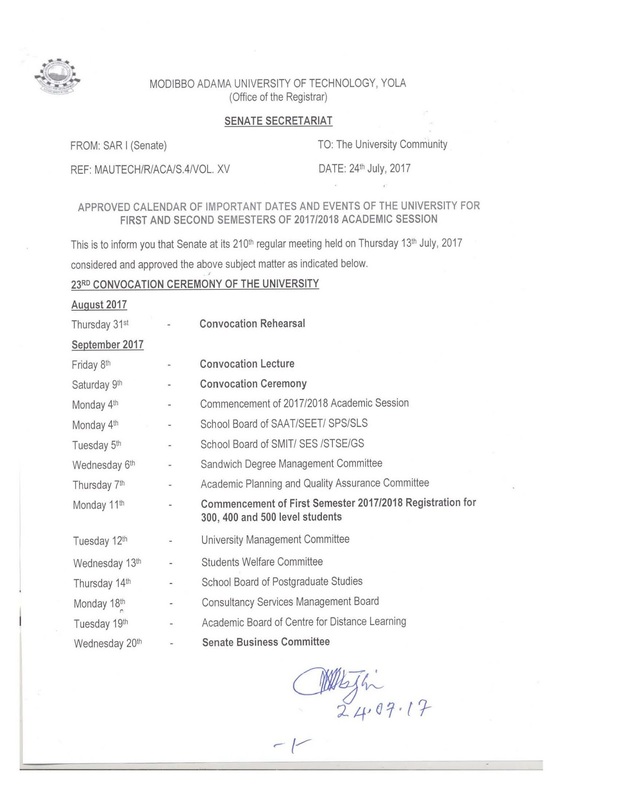 The 2017/2018 Academic calendar for Modibbo Adama University of Technology, MAUTECH is officially out. The Management and Authorities of Modibbo Adama University of Technology(MAUTECH) has officially released the academic calendar for 2017/2018 academic session as seen below. Lecture begins for 300 – 500 Level Students. End of Late Registration for 300 – 500 Level Students. As you can see in the picture above, the calendar was approved after the Senate meeting that was held on Thursday 13th of July, 2017. Feel free to ask any question and don’t forget to share with friends on Facebook, Twitter and Whatsapp.